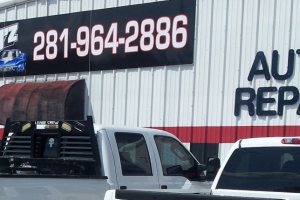 We are located 5 miles west of Highway 59 and 5.5 miles east of Interstate 45 just north of the Intercontinental Airport on FM 1960 RD. West. Our 6000 square foot facility is air-conditioned both in the reception area and in the shop for our technicians. We are on the North Side of FM 1960 RD. West and our Black and White Checkered building sets about 200 ft. off of FM 1960. Whether it is an oil change, a break job, a check engine light, or a custom tune on your hot rod you will find the same fast and friendly service at “Whitty’z Diesel and Auto” your “TRUSTED NEIGHBORHOOD SHOP”. While we are the Humble Auto Repair & Diesel Repair experts we do serve Spring, The Woodlands and North Houston.